Do you have a farm or show facility and wonder if you should have your shows on the FADS Show List? Do you have a farm with show amenities but have never given a dressage schooling show? Read below for information on having FADS shows at your farm/facility. What is FADS? 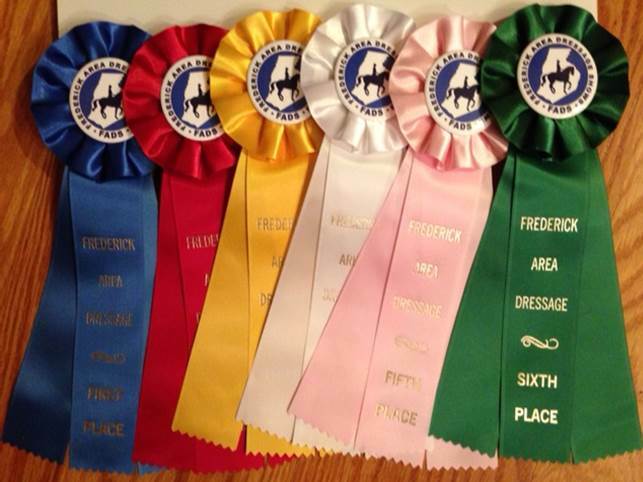 Frederick Area Dressage Shows (FADS) is a free web-based marketing service that provides a list of independent dressage schooling shows located in the Frederick County, Maryland, area. Shows may be located in Frederick or other nearby Maryland counties and nearby states. The FADS Show List, and other FADS show information, is maintained on the FADS web site at www.FrederickDressage.org. A FADS Email List is also being maintained to market FADS show information. The costs of the web site and email list are donated by Leslie Raulin, who is the marketing volunteer for all shows on the FADS Show List. FADS Show Theme. The overriding theme of shows on the FADS Show List is a casual, fun and friendly atmosphere to strengthen the dressage training and partnership of horse and rider. The shows are casual (riding jackets optional; approved fastened helmets and riding-safe footwear required). Horses new to or anxious about the show environment are given every opportunity to have a positive experience. Riders new to or anxious about the show environment are provided guidance to ensure their showing experience is positive and educational. Scheduling to ensure that every rider gets a ribbon for every ride is encouraged. Can a farm have combined training or other additional mounted activities during a FADS show? No. FADS shows are pure DRESSAGE shows. No other mounted activities may be scheduled at the same time as a FADS show nor as part of a FADS show. This ensures a calm supportive DRESSAGE experience for horse and rider. Does FADS list clinics or other mounted activities? No. The FADS Show List is a list of independent casual dressage schooling shows so there are no clinics or other mounted activities listed. Therefore the FADS Show List does not include activities with clinicians giving lessons to riders and/or training horses and does not include fix-a-tests. Farms with shows on the FADS Show List manage their shows independently. Farms provide their own facility, provide their own show insurance (must have insurance that specifically covers all activities at each show), write their own hold harmless agreements (hold harmless agreements must include "volunteers" in the covered entities and must be maintained on file until the statute of limitations expires (3-5 years in Maryland)), choose their own show dates (click to view the FADS calendar to avoid scheduling conflicts), determine what dressage tests are offered (specify in the prize list), write their own prize lists, establish their own entry procedures (specify in prize list), determine and collect their own ride fees, hire and pay their own judges, schedule their own ride times (send to FADS webmaster as soon as they are available), provide their own volunteers, compile their own show results (send to FADS webmaster within two days of the show date), pay their own bills, etc. They also provide their own dressage arenas and letters, office supplies, dressage test sheets, ribbons (FADS ribbons are available at cost, see below), etc. Farms with shows on the FADS Show List cover the cost of holding their shows and may keep the profits. Farms collect their own ride fees, pay the judge(s), pay for their show insurance, pay for judge and volunteer lunch and snacks, pay for show ribbons (FADS show ribbons are available at cost, see below), etc. The farms may keep the show profits and/or donate the profits to a worthy equine or non-equine charity. Show Date(s). When choosing date(s) for your show(s), please consult the FADS calendar (click here) to avoid conflicts with other shows, particularly FADS shows. FADS Online Entry Form: The FADS web site provides an easy FADS Show Entry Form for which the entry information automatically goes to a designated email address. This method does not automatically provide money, Coggins, or signed hold harmless forms. These may be collected at the show, farms may require entrants to snail mail them before the show, or other methods of submission (such as online payment from your web site). Farm Online Entry Form: A link to an online entry form on your web site can be provided on the FADS web site. Snail Mail: Riders submit the entry, supporting documents, and check via snail mail. Other Methods: Farms may request other show entry methods, as desired. A farm's method of show entry should be clearly stated on the prize list; the information will then be included on the FADS web site. Each farm is responsible for collection of their own ride fees and payment of show bills. Farms with shows on the FADS Show List provide show information to the FADS webmaster. Information about shows on the FADS Show List is posted on the FADS web site in a timely manner. Ride times (provided as a file). Ride times must be provided to the FADS webmaster as soon as they are available. The riders will be added to the FADS Email List, from which they may opt out if they do not want to be on the list. The rider information will only be used for FADS communications; it will not be provided to other parties and will not be used for any commercial venture. FADS ShowWare. A software program is available for use with FADS shows. Program requirements are a PC with Microsoft Access 2103 or later (or the free downloadable Microsoft Access 2103 or later run-time version) and Microsoft Excel. Shows using a PC are HIGHLY ENCOURAGED to use FADS ShowWare as, among other things, it produces the results files that are required for the FADS WebMaster. Click here for more information. Show Ribbons. Farms with shows on the FADS Show List may use their own show ribbons or may use FADS show ribbons, which are available at cost when requested with lead time. The current cost is $1.65 per show ribbon. A photo of the FADS show ribbons is below. Can a farm hold a tack sale, sell food, etc. during a FADS show? Yes, but only if the activity is covered in the show's insurance policy and only if the activity is permitted by state and local laws. For example, some insurance companies require additional coverage for tack sales. The state of Maryland requires a license to sell food that is not commercially pre-packaged. FADS Season-End High Score Ribbons. The FADS Show List has two show seasons: Spring/Summer (April-October) and Fall/Winter (November-March). The Spring/Summer season will have a maximum of 30 shows. The Fall/Winter season must have at least six shows to have high score awards. At the end of each show season FADS Season-End High Score ribbons will be awarded to horse/rider pairs that compete in at least two shows on the FADS Show List at a dressage level or division. The FADS webmaster will track show results to determine the high score categories and recipients. Farms with shows on the FADS Show List during a season agree to share the cost of FADS Season-End High Score ribbons for that season on a per ride basis. The cost per ride will vary for each season, based on the total number of rides, the number of ribbons awarded, and the number of ribbons that are mailed. The cost per ride will be determined after the ribbons are mailed. For the past show seasons, the ribbon cost has ranged from $.25 to $.64 per ride. A photo of the season-end ribbons is below. How to add a show to the FADS Show List: Click here for information on how to submit show information to the FADS web master. A show can be added at any time during a show season or before the next show season. Why should a farm have their shows on the FADS Show List? Farms with shows on the FADS Show List become part of a dressage schooling show community whose goal is a casual fun and supportive show experience. Their shows are advertised via the FADS web site and FADS emails. The farms design and manage their own shows and can keep or donate the show profits. Guidance is available but farms develop and host their own show(s). We keep the fuss out of dressage! 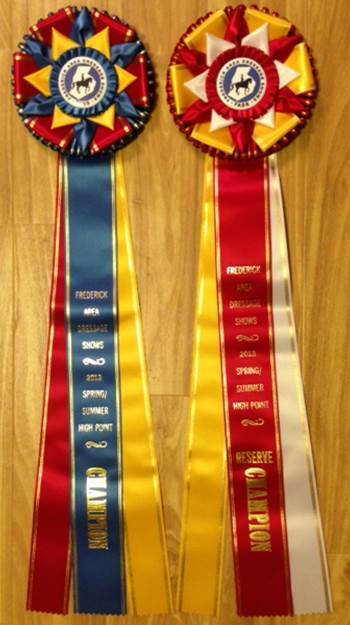 FADS Show Ribbons - Available to FADS Farms at cost. For information contact RAULINL@yahoo.com. FADS Season-End Champion and Reserve Champion ribbons.